One of my main issues with the original Fable was that the “are you good or evil?” premise was never fully realised. You could be bad, true, but it never had any more effect on your experience than causing people to run away muttering something about that messy rampage that may have accidentally taken place last week. The world changing shifts, however, just weren’t evident. 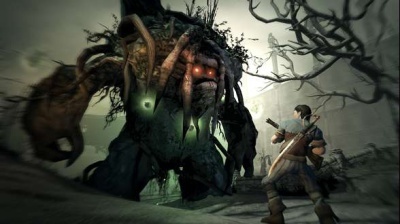 The sequel to Lionhead’s action-RPG begins with a very subtle and engaging tutorial. Wandering around a snow covered old town, basic mechanics are explained and the story is unveiled. Early quests are constructed in such a way as to allow a nice or nasty path to completion, or even a hint of both. For instance, whilst clearing a warehouse of bugs a leering old man offers gold in return for the destruction of the stock. Certainly a tempting offer and an indication of how a personalised moral maze can be mapped through the land of Albion. Choices will affect more than just how citizens react a hero’s presence. There are key moments that can affect the look and feel of the land itself. Helping or hindering a lawman will see a suburb flourish or sink into disrepair; not donating to a renovation fund for a remote village could cause it to be taken over by criminal elements; and turning a blind eye to bandits in the forest early may allow them to run riot. Realising that these differences are down to your actions (or lack of) can be quite striking. Though knowing a community has been condemned or helped can only truly be appreciated if you are either in constant chatter with friends going down different paths or are willing to play through Fable II multiple times. Whilst these grander effects are clearly evident, more minor inter-person misdemeanours are seldom as weighty or permanent. Most can be laughed off with a quick jig or arm pump meaning that some negative actions can be performed time and time again without fear of reprisal, causing a disconnect from the larger principle of Fable. The main story line is even less affected by a player’s behaviour and is played out extremely weakly, possibly to cover this fact. Whether you create the biggest, baddest, most corrupt and ugliest son-of-a-balverine that the poor citizens of Albion have ever happened upon or a character on a path that will ultimately see you walking on water, the main quest will continue undeterred. Alignment does, however, open up different side-quests and whether they are enough to replay the whole experience is down to personal tastes. Following the path of righteousness has its benefits whilst the darker route definitely offers more comedic highs. Nowhere else can offer Social Displacement missions (“’kidnapping’ didn’t poll very well with the public”) or enlistment into the Temple of Shadows (where the Wheel of Misfortune keeps its members happy until poker night). Personally, this is where the strength Fable comes from: in the distractions that it has to offer. Much like the framework set out by other open games, if progress in the storyline is tough then choose from a wide variety of additional activities. Try some socialising, economic expansion or just some simple light hearted side-quests. Hours would literally pass by before I remembered about the main quest and I would have to excuse my current activity (usually Gargoyle hunting), grab my sword and head off into the forest. For the vast majority of my initial playthrough, I spent my time starting a family and providing for them through my ever-expanding business empire. Getting my wife Jessica the Farmer to notice me at first was easy enough, with a few heroic poses and dance moves gestured in her direction, but wooing a fine maiden comes at a price. So came the graft at local jobs (wooding cutting, blacksmithing and bar tending, which all come in the form of a mini-game to raise cash) to buy her presents and overtime at the chopping block filled my purse enough to buy a quaint cottage on the outskirts of town. Not content with that, we saved enough gold to buy the fruit and veg stall on our doorstep and slowly the profits from that went into buying up half the village. For Fable to turn out to be a wannabe-property-mogul’s dream was surprising. Investing in the housing market is a sure-fire way to earn money, with rent being collected every few minutes. This is offset by having to pay maintenance on any families secreted about the landscape but before long money will not be an issue. Cash on the whole is moot point, anyway. Considering the game’s scope, there aren’t that many items to buy from the world’s shops with only a comparatively modest selection of weapons and clothing. 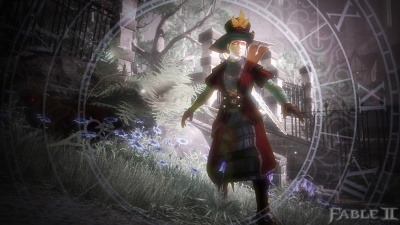 If Too Human had too much loot then Fable sits at the opposite end of the spectrum with not enough variety to make characters feel truly unique. A hero will know which getup best suits them so don’t expect to be rooting round dungeons or stalls at midnight expecting to find a hidden gem of an epic hat. Whenever that pesky matter of saving the world does crop up a solid quest line is presented, throwing bandits, goblin-like Hobbes, ninjas and werewolf-esque Balverines around liberally. No fear, though, as each hero comes equipped with a melee attack, some form of ranged weaponry and a bag full of magic at their disposal. Each is assigned to their own button respectively and fights play out as you see fit, bashing on the attack of your choice. Extra abilities and combos can be bought and upgraded by spending accumulated XP to open up a more interesting brand of combat. Initially my hero started out as a brawler but as time went on I unlocked the ability to raise a horde of the undead to do my bidding and swamp my foes. Eventually I stepped away from necromancy and I finished my heroic career as a marksman with the skill to snipe a man in the crotch at a hundred paces. The melee and ranged combat are reasonably standard no matter what weapon is being wielded and so the variety will be down to the type of magic employed. Force pushes, lightning strikes, fireballs, time control and flying daggers are all on offer. Mixing and matching those on the fly is where those wanting stylish combat can truly find it and it seems that no two people have the same fighting style. Some opt for teleporting behind a target and stabbing them in the back whilst others have the common decency to at least flame them face to face. It would be nice to think that these skills could be shared with a friend in drop-in/drop-out co-op but I would not recommend it. Fixed to the primary player’s camera view, co-op partners are limited to making expressions and bashing people over the head, all with a character that has no resemblance to your hero, too. The whole premise is far too limiting to be a worthwhile experience. 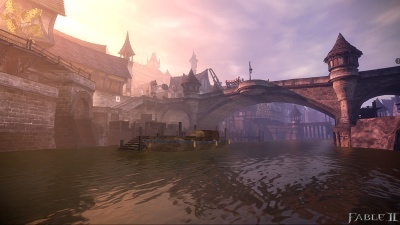 Fable II to me is like Crackdown: a game where I loved being involved in a journey through a world from the beginning to the end. However, now I’m done I’d prefer to start over rather than tour that same world now it’s been saved. Aside from the very poor payoff for doing so, I loved building up a reputation, taking my first steps to owning all the property in the city and generally fighting my way up from the bottom of the pile. When the biggest boss in the game has been defeated, what else is there to do? Restarting is not something that would be a chore, either. After you’ve played Molyneux’s game through once you’ll want to try and explore the avenues that you missed, both in the world and in your moral judgement. What would happen if I joined that dark cult? If I were faster to that person’s aid could I have saved them? Where is that last blasted Gargoyle? Don’t expect stories to be rewritten but there is enough charm and depth to make it well worth your while. Just last week I was bemoaning my precious Spurs’ situation and suddenly over the weekend it seems that a much needed dose of hope has been injected into the club. In one crazy eighteen-hour period we sacked four prominent backroom staff, appointed a new manager and then turned Bolton over by two goals to nil for our first three points of the season. Only that very night, just hours before it all kicked off, I was mulling over the dismal season so far with other football fans and so to return home to find the news of Redknapp’s appointment breaking was quite surreal. Part of our debate had been who could replace Ramos should he be given the push and Redknapp never even entered our consideration given how he had previously turned down other jobs and had stated how happy he was on the south coast. Quite frankly, I don’t think I could ask for anyone better to help us dig ourselves out of the hole we find ourselves in. Harry has a proven track record with pulling teams up by their bootstraps, Portsmouth being an excellent case in point, and I believe he can get the players going and playing to their potential. Just seeing how he and Clive Allen handled the team on Sunday after only a couple of hours together has at least got me considering that Modric might be worth his price tag after all. It’s a long way to go and we have a very difficult run coming up but at least we now have that English grit that I was looking for – he just sees to be in the dugout and not the midfield, that’s all. After Peter Molyneux started rating his own game before it had been launched, I began having a few worries that we were going down the route that Dennis Dyack took with Too Human. 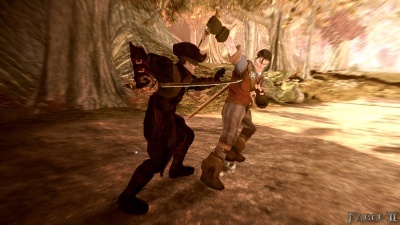 Both developers have been known to occassionally talk a little too much but the difference here is that Fable II actually seems to be worthy of your attention. Lionhead’s new title really has its hooks in me and I’m currently running around Albion raising a family, setting up a thriving business portfolio and occassionally even finding the time to go and bash some fat goblins over the head. If you’re looking for a box quote: it’s like Oblivion but with character. That’s true, too. As great a feat as Oblivion was, I always felt it was always a little flat. 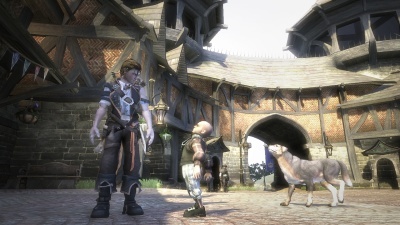 Fable may be smaller in terms of scale but the game’s softer, caricatured style can be equally both more friendly and much darker, leading to a more engaging world. If you’ve played the first game then the feel is very similar but with one big positive in that the combat has been reworked and streamlined. Very much like Force Unleashed, you have three different weapons linked to three different buttons allowing you to easily swap to a fighting style that is suitable to your situation without having to learn countless combos. Although effectively one-button combat, it never feels overly limited as you have the option to pull many magical spells from your bag to liven things up should you so wish – making a horde of zombies rise and do your bidding is always useful. For me, the sign of a good game is one where you keep getting distracted from what you originally intended to be doing. Older GTAs have had that and so does Fable as my march towards the next quests gets put on the “to do” list as an interesting path takes my attention, which then leads to a new village to explore, which leads to new jobs, and the job to a different quest, and is that an attractive maiden over there….where was I? The one utter disappointment, though, is co-op as it is fundamentally broken. At any point you can jump into a friend’s game. This may sound cracking but when you do jump in you are playing a nameless henchmen and not your hero, you are constrained to their camera view making for extremely restrictive movement and you cannot interact with any of the characters or shops. It is frustrating and utterly unproductive as you cannot do anything without coordinating movements with the main player. Any one of those on their own would prove annoying but the mere fact you cannot move around freely means that I am never touching co-op again, usually a feature that elevates a title in my eyes. That aside, Molynuex’s score may be right, it’s probably why he marked himself down. Currently, there appears to be an impending and inevitable sense of doom at White Hart Lane as Spurs have made their worse start to a season ever. Earning only a pair points from their first eight games and after losing to the two of the three newly promoted sides I struggle to see how this sort of form can be turned around. As Dawson saw red on Sunday, reducing us to to nine men and flushing away any chance of salvaging something from the game, I have to admit to launching my joypad angrily across the room. This was a team that finished fifth two years running, lifted the Carling Cup last year and are now prime candidates for Championship football. Glancing at the Bundesliga only serves to darken my mood further as our former manager is sitting pretty at its peak with his new team. When it comes to assigning blame for Tottenham’s situation, fingers can be pointed to many quarters but I think it would be foolish to start sacking people on mass at this stage. This is the same board that helped us to the success of recent seasons and we have a proven European manager at the helm. I do believe that unstabilising the club further would only make matters worse. That is at the moment, anyway. What we do need is to gain some grit and stability on the pitch. The heart of the team has been ripped out over the last ten months and replacements have seemingly been chosen by sticking pins in the transfer list. We have flair players coming out of ears but many are finding it hard to settle into the English game and what we truly need is a presence in the defensive third, our own Gareth Barry or Owen Hargreaves to cut out the constant pressure placed upon on the back four. The phrase “too good to go down” is a load of tosh. Over the years many Premiership stalwarts have dropped down to the second tier and beyond and I can assure you that no team is untouchable. What we possibly are, though, is too rich to go down. The last couple of seasons have seen us go on spending sprees only rivaled by Chelsea. When it comes to January I can only hope that the cheque book is opened wider than ever and, just like West Ham, we spend our way out of trouble. Of course there is no pride to be taken in using that route or guarantee that that tactic will even work, but it looks as though that maybe our last roll of the dice. 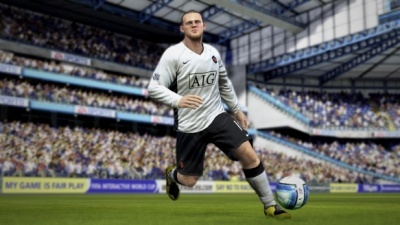 So I’m a few days into FIFA 09 now and I’ve had a chance to – excuse the pun – tackle a lot of what it has to offer and so far I am not regretting my switch from Pro Evo one bit. From the traditional season through to the Be a Pro mode and on to Live multiplayer I can’t say I really have any complaints. Players are responsive, play is fluid and the game is another step in the series’ movement away from the high-scoring pinball football of its past. There are moment when I forget myself and think I’m in a FIFA from a decade ago, trying to charge my way through defences or shoot from 30 yards on certain angle but never to any joy. The biggest challenge I’ve found myself facing so far is that of the Be a Pro mode. I’ve chosen to be a midfielder in the current Spurs team and it’s proving to be a bit of a slog. Whilst I can track back and help out on the defensive side, the rest of my team seem unable to score or even willing to pull the trigger in front of goal. With my limited forays upfront and my lack of skill when faced with the onion bag I don’t think we’re going to push for the league title this season as so far out of seven games we’ve drawn six, won one with a debious penalty and only scored another solitary goal from open play. My traditional season is fairing better with my team in a European spot. I still struggle in front of goal but this version of FIFA brings out what I loved about the Pro Evos of the past: it allows you to string together some swift, cutting play that you’ll want to watch again and again and again, or it’ll sit you back and let you lump the ball forward all day long for a lofty centre forward. What it won’t do is make it easy when under pressure so you do really need some space to make a difference, just like in the real game. Of course, if you do have a moment of magic you can always capture it, upload it and then replay it again and again and again. So what did you take away from TGS? Anything monster? Back home I’m still without a Xbox hard drive and I’m twiddling my thumbs, relying on a storage device that is only just large enough to hold my profile and a Halo save game. It’s a good job my copy of FIFA 09 appears to be lost in the post as I don’t think I’d have room to save out a season’s campaign even if I wanted to. 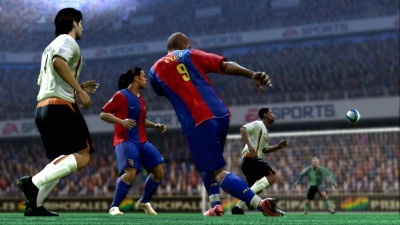 This year the classic choice of FIFA or Pro Evo has swung in EA’s favour, for once. It’s been a good few years since I’ve bought into their highly polished version of the beautiful game but with all their leaps and bounds forward, compared with Pro Evo’s continuing insistence to neglect to fix up niggles that have plagued the series for years, I’m happy to invest. Play seems smooth and natural, and for as much as I have the greatest respect for Konami’s efforts they just haven’t evolved enough, in my opinion. Continuing on from my enjoyment of UEFA 2008’s multiplayer, FIFA brings with it what can really only be described as a clan system. A whole squad of you and your friends can get together, form a “club” and then up to ten of you can play online at the same time in the same team. Obviously this could be disastrous and I initially had visions of a school playground where players would flock after the ball like birds in migration, but when executed well with a group of competent team mates it does have tremendous potential. The sticking point may be which team we adopt as I’ve seen one friend obsess over Cheltenham town, we have a Cardiff support in our ranks and Spurs aren’t exactly setting Europe alight this season. We may have to go for some neutral ground… Spain or Brazil, maybe, as a compromise. Some may think a Red Ring of Death is bad. Your whole console fried and only brought back to life by a return trip to Xbox support or a quick smothering in towels. The one thing you have to remember with this, is at least your data is safe; tucked away on a separate hard drive, it may look sorrowful and useless on its own but at least you know that when your console comes back from the dead it will be ready to roll once more. I say this because only a couple of days ago my hard drive died and it’s hit me bad. Out of all my recreational belongings this was the thing that I never wanted to lose. You can replace discs, sports equipment, board games and books. Here, though, many years’ worth of save games have gone: all my Viva Piñata gardens, my Halo replays, my Guitar Hero set lists, my Crackdown orbs, my Tomb Raider levels, my Carcassonne tiles, my Lego pieces, my Portals, my Penny Arcade character, my entire 360 archive. Looking down my gamercard, it may not appear that many were played frequently but that was never the point. During lulls in releases it was always great to get Crackdown out and bound around the city, or when friends were round to reveal the guitars and wail on them. For some I can find unlock codes to help me out but others I just don’t have the heart to play through again and unfortunately Viva Piñata is amongst them. I’ve sunk over 150 hours into both games and I just can’t face that again, I really can’t. Quite touchingly, this image is the last thing I pulled from my hard drive before it keeled over. Whilst watching a replay of the previous night’s session of Halo, I found my brother and I shoulder to shoulder in combat against the Flood. May it stand as a monument to my fallen hardware. Have you seen the new DS? They call it DSi – for those who don’t already possess enough gadgets with a lower case ‘I’ in the title – and it’s arriving in Japan next month. The new model sees the addition of a camera and the ability to download software from Nintendo’s online service, as listed succinctly by 1UP, and I’m still trying to make sense of the decision. 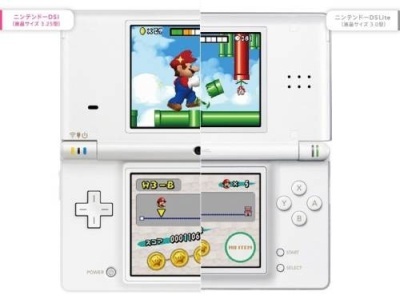 I was very happy to upgrade from the original DS to the DS lite because it gave me the added benefit of a significantly better screen, longer battery life, a sleeker design and, most importantly, a more comfortable layout and feel. With this third iteration of the hardware, I can’t say I’m snared by the changes. Whilst I can see the potential for the camera and the new SD slot, I have other concerns. As per the motion add-on for the Wii, it does seem that once again Nintendo are in danger of fracturing their own market with something that is too decidedly similar to what is already out there, and you have to wonder if it is worth the effort. The GBA expansion slot has also been removed to slim down the handheld’s profile but by doing so you are also making Guitar Hero and titles that use the rumble pack backwardly incompatible. My own personal take is that I would have much preferred a completely new DS; an upgrade in specs and capabilities but still with backward capabilities. Whilst I’m all for new features the added options, if widely used, could alienate the multiple millions of owners out there. Conversely, I suppose those multiple millions of users are also why they aren’t jumping ship quite yet.